Happy new year everyone, and welcome to alpha 16. It’s a big one. For starters, all ‘Name in the Game’ customers can now customize the size, face type and colour of their prisoners by using our new Name in the game system which you can find here. For two weeks only, we're offering all alpha customers the chance to upgrade to our Name in the Game tier for only $10. This will enable you to name a prisoner, write a short bio about why he's inside and customize his look. This is your opportunity to permanently stamp your personality on the game and prove that you were one of the generous few that helped Prison Architect to become a reality. We’ve made extensive improvements to the AI across the entire range of the game. For the first time ever it is now possible to fully segregate your prison based on prisoner category. 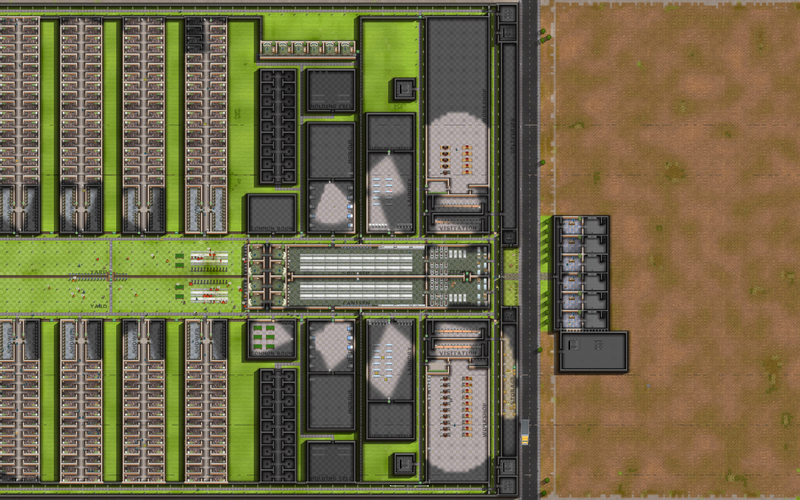 You can (for example) create an entirely self contained ‘wing’ within your prison for maximum security prisoners, with its own cells, its own canteen, its own yard, even its own laundry service (staffed by maximum security prisoners of course). These AI improvements also cover the ‘industry’ side of the game, meaning kitchens/canteens/workshops/laundries are all much more efficient, and prisoners staffing them work much more intelligently. Fundamentally the game previously supported only one of these room types. This change is difficult to see in the video, and perhaps hard to fully appreciate, but it touches every area of the game. With such an extensive change, we’d expect to have introduced quite a few bugs as well as fixing many more. A side benefit of this change is that prisoners are now able to tell when their route to freedom has not been locked. We see a lot of prisons on Steam Workshop that keep the front doors permanently unlocked, and even sometimes unlock entire sectors (For efficiency - it means you don’t need to wait for guards to unlock doors all the time). What kind of prisoner wouldn’t want to take advantage of this if they could? So prisoners who are near the front of your prison and notice the doors unlocked *might* decide to make a run for it. The more dangerous the prisoner, and the closer he is to the exit, the more likely it is to happen. We’ve added new options to procedurally generate your starting landscape so it looks a bit less empty. Lakes, forests, sand and even derelict buildings can now be found within your zone. Lakes block all construction and movement, forcing you to be creative in your layouts. The forests have to be cleared but the lumber is itself a resource that can now be harvested - order your workmen to cut the trees down and then sell the logs for a quick cash injection. Later on when you have a functioning Workshop you can process logs into planks of wood on a bench Saw, and sell the resulting stacks for greater profit. If you find you have some spare space within your land you could even consider planting your own forests, to be harvested entirely for profit later. Trees are now planted by gardeners, begin life as saplings, and take a long time to grow to full size, so this is a long term but highly profitable industry if you have the space. We will be expanding this new wood industry in future alphas, letting you use your prisoners to do the tree planting and felling, and training your prisoners in carpentry to produce high quality furniture from the refined planks of wood. We’ve extended the mod system so you can now use Steam Workshop to share your mods, or download existing mods. This works in a similar way to prison sharing - just ‘subscribe’ to a mod from within Steam, and it will show up within your mods window auto-magically. Anybody who has tried to build a prison that spans the road will have found it pretty much impossible, because you cannot build on the road and therefore cannot create a secure zone between the east and west sides of your prison. We’ve introduced a new Road Gate which can be built to span the road, allowing you to run a secure deliveries zone. These road gates act just as all other door types, requiring a guard to unlock them when vehicles want to pass through. All of that plus a vast collection of bug fixes detailed below - alpha 16 has been a huge update to the core of the game, and has brought us a lot closer to our final vision of how the AI should function. We hope you have fun playing the new version and hope you have a great Christmas, and a happy new year. Warning: Including lakes can make your map totally unplayable. Experimental! mods shared outside of the Steam Workshop. - Doors now open at different speeds. A normal wood door is the fastest. The large road gate is the slowest. The Large jail door opens slower than the normal jail door. Be careful when setting zones to "Unlocked" (green), or setting doors to "Locked open"
no longer on site - either dead, escaped or released. Anyway, Chris, I wanted to buy Name in the game on steam but I cant because I already got PA game.. I try on your website but it needs PayPal, ONLY! I have paysafecard and I always use it to buy games...How can I pay Name in the game with paysafecard? Really nice update, I saw some weapon racks in the alpha video, can we expect armed guards in the next update? I saw a room called armory. Thanks for this greateful game. Last edited by rsdworker on Fri Dec 27, 2013 3:35 pm, edited 1 time in total. Guys, even before Alpha16, Alpha15 materials.txt said Armoury and Library. Though we see that they do not feature in this alpha and is very likely to feature in alpha 17. One of the biggest feature behind of gangs,multifloor,watchtowers etc features. And I appreciate the offer for the Name in the Game upgrade. I had the standard edition, but no longer. For starters, all ‘Name in the Game’ customers can now customize the size, face type and colour of their prisoners by using our new Name in the game system which you can find here. All i'm seeing in the link is the choice to upgrade for $10. Looked in game too and no options to customize look, just transfer prisoner. Any help for those of us who previously purchased 'Name in the Game' and would like to customize prisoner? Last edited by Atticus on Fri Dec 27, 2013 11:30 pm, edited 1 time in total. To me this is the best update so far, thanks IV! another problem were the energy and water pathways. it wasn't possible under the street and i need an extra powerstation on the other side... but its fixed. thx for that! edit: why my trucks now hate the street and deliver offroad? Last edited by froesch on Fri Dec 27, 2013 6:25 pm, edited 1 time in total. I notice that prisoners are not taking foods..